How did you meet? Through a mutual friend on a random night out in Los Angeles. Describe what you do: I’m a master instructor in group fitness training at Barry’s Bootcamp. Three words to describe you: Good listener, patient (to a fault) and humble. Favorite hobbies: Teaching fitness classes and watching movies. What is the accomplishment you are most proud of? Uprooting my life on the West Coast and starting a new chapter with work on the East Coast. What famous person reminds you of yourself? Physically, people have said Mark Consuelos. What famous person reminds you of your teammate? Nobody. I even looked online and nothing! What scares you most about traveling? Getting kidnapped or dying abroad. What excites you most about traveling? Immersing myself and learning about the culture of the country/city through its locals. Biggest challenge you and your teammate will face on The Race together: We can be very indecisive on the smallest things. Pet peeve about your teammate: His complaining. What country and place would you most like to visit and why? The Seychelles. Pictures of the islands look breathtaking. What do you hope to accomplish by running The Race (other than winning one million bucks)? Experiencing travel in a completely different way. How could the Race change the current state of your relationship? It will force us to make constant in-the-moment crucial decisions more often. The high stress level of the show will definitely test us. Describe what you do: I am a member of pop group New Kids on the Block. Three words to describe you: Modest, giving and loyal. Favorite hobbies: Farming/gardening, DIY projects and snorkeling. What is the accomplishment you are most proud of? Being fortunate to have the same career for 30 years that I started when I was 16. What famous person reminds you of yourself? Photographer Lynn Goldsmith called me young Elvis when I was young. What scares you most about traveling? Toilets in third world countries, “street meat” and sickness. What excites you most about traveling? The unknown, seeing different cultures and landscapes and meeting amazing people. Biggest challenge you and your teammate will face on The Race together: We tend to be indecisive. Running The Race we are going to have to make quick decisions and pick which one is best. Pet peeve about your teammate: He tends to be late for things. What country and place would you most like to visit and why? I have been lucky to see a lot of the world. There are a few countries left to see though! All would be equally amazing to see in their own right. What do you hope to accomplish by running The Race (other than winning one million bucks)? I hope to gain skills that will forever enhance our communication and life together. How could the Race change the current state of your relationship? It could bring us closer together working as a team or tear us apart. Huh. 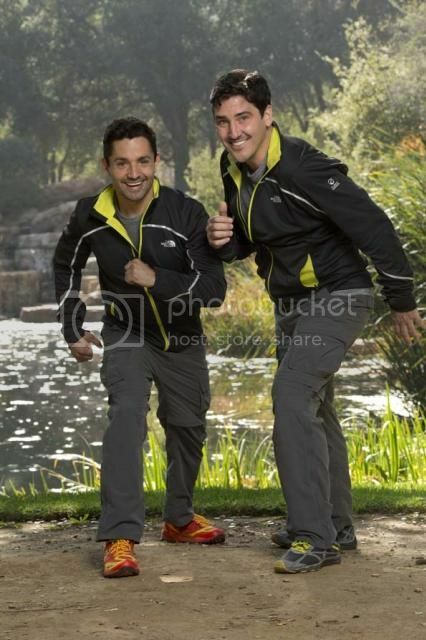 The guy who suffered Panic attacks from his time as a New Kid on the Block is going to be on The Amazing Race. I wonder how this is going to go. I don't know if Jonathan has the 'right stuff', but if he takes it 'step by step', it sounds like he and his partner will still be arguing all the time. That was terrible, goobie. Just terrible! Ha! They have trouble making decisions as a couple and the partner is always tardy. These two are going to be first out. Aww… I always thought he was the cutest of the NKOTB and I had his poster on my wall in 6th or 7th grade. As young teens, I think we all knew Jonathan Knight was batting for the other team.....however, I never expected him to end up with a mini-him, pocket partner some day!! Great, Copssister now I'll never not be able to see them and not think of the one as the Pocket Gay (WIll and Grace). So, how many matchy-matchy outfits do you think these two have? Well, they will only need three since they will be first out. He does look like a mini-me, that's funny. They seem like pretty nice guys. I do think their time is short, though. Well thank you NEL for saving them. Jonathan I can take or leave, but I like his partner, Harley, so far. He reminds me a little bit of Hal Sparks in the looks department. Now, I'm 20 minutes into the show, and they haven't even landed. I am guessing they are toast. Seriously, why did we have that NEL last week? Useless, as it was foregone that NewKid would be going. They seem like pleasant people, but I'd rather the NEL save a team I really like.